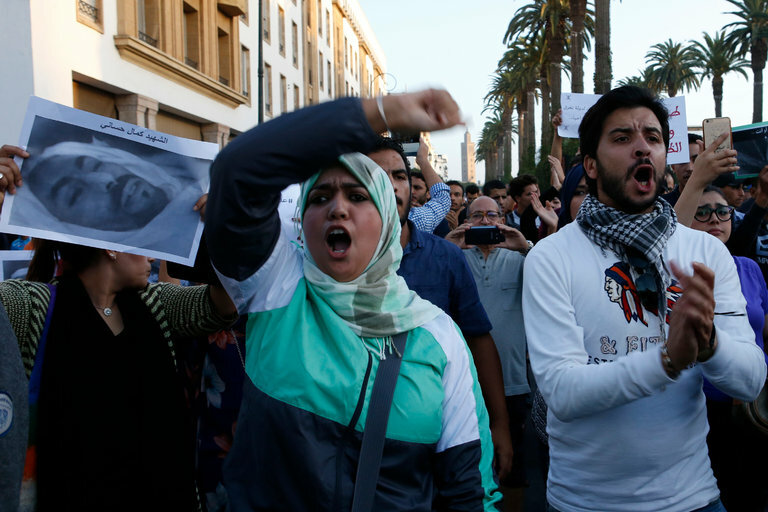 MARRAKESH, Morocco — Protests erupted across Morocco over the weekend after the death of a fish vendor who, according to witnesses, was crushed by a compactor after he jumped into a garbage truck to retrieve his merchandise. Grainy images of the man, identified in news accounts as Mouhcine Fikri, 31, circulated after his death on Friday night, in the northern port city of Hoceima. The city immediately erupted in protests, which spread on Sunday to cities like Marrakesh and Rabat, the capital. King Mohammed VI of Morocco ordered the Interior Ministry to conduct “a careful and thorough investigation,” and to bring charges against anyone who had broken the law, the state-run Maghreb Arabe Presse news agency reported on Sunday. According to news accounts, Mr. Fikri and several friends dived into the garbage truck after the authorities confiscated his merchandise, around $11,000 worth of swordfish, a protected species in Morocco. As the compactor started operating — it was not clear how or why — the friends jumped out, but Mr. Fikri was stuck inside. A witness cited by local news reports said he had heard one of the police officers involved in the episode ask for the trash compactor to be activated to scare away the men, who had surrounded the truck. According to the news reports, officials described the death as an accident. On Sunday, thousands of men marched on a hill above the Mediterranean Sea behind Mr. Fikri’s coffin. “Don’t forget us. Don’t forget Al Hoceima,” one of the people taking part in the funeral march could be heard saying on a Facebook video of the event. Many shops in Hoceima were closed in solidarity with Mr. Fikri’s family. Mr. Fikri’s death had the potential to become a volatile and potent symbol. The death of Mohamed Bouazizi, a fruit vendor in Tunisia who set himself on fire in December 2010, became a catalyst for the pro-democracy and other protests that came to be known as the Arab Spring. Mounir Agueznay, a human-rights activist from the area around Hoceima, said that while news reports were emphasizing the political dimensions of the tragedy, the protesters were seeking only justice, not the destabilization of Morocco. “Authorities are nowhere to be seen,” Mr. Agueznay, 30, said by phone. “They are letting the protesters do whatever they want. The Party of Authenticity and Modernity, a political party founded by an adviser to the king, called for a speedy investigation, while Prime Minister Abdelilah Benkirane, who leads the Justice and Development Party, a moderate Islamist group, appealed for calm. Hoceima is part of a mountainous region of Morocco, the Rif, that has had a rebellious history with the monarchy. The Berber population in the region waged war against Spain, then Morocco’s colonial ruler, in the 1920s, and the Rif was home to a violent rebellion against the monarchy in the late 1950s, shortly after Morocco won independence. The region is poor and isolated, but has started to get more attention from the government in recent years. Hoceima has become one of the favored vacation spots, and has been home to several tourism and development projects. Story one the New York Times' website.